To keep you current on the most recent news about cats. To let you know about the most up-to-date offers from online cat supplies stores. To tell you about new articles, changes, or corrections to MyHealthyCat.com. To provide a place for me to tell you about my two cats, Neko and Shayla! To give you an opportunity to comment on any of these things, or anything else you want to say about cats! You can write to us through any of the "email us" links included with each cat blog entry, or use the form at the end of this page. Visit my current Healthy Cat Blog. Archive #1: 17 May 2004 through 28 June 2004. Archive #2: 1 July 2004 through 31 August 2004. It's been nearly a year since my last cat blog entry. It seems that when things are going well, there's nothing to write about. And that's good! But now, unfortunately, things are not going well in my cat household. People with healthy cats are some of the luckiest people around. I think we can tend to take our cat's health for granted sometimes. But when they get sick, there’s almost nothing we wouldn’t do for them. Unfortunately, Shayla, my 12-year-old cat has taken ill. She's been a very healthy cat all of her life. Of course, she had the usual upper respiratory infection when I brought her home from the SPCA when she was eight months old. And she's had what veterinarians call cat herpes in her eye (she has a little discharge in times of stress). Other than that, she has been perfectly healthy. And now she's ill. I don't know the exact problem yet. I've had blood work done and things look normal except for some slightly high numbers that have to do with her kidneys. That makes sense given her age. But the crisis thing right now is that she hasn't eaten for two days. We're going into the vet again tomorrow first thing. I hope that they can give me some answers. Apparently, there are secondary things, like Hepatic Lipidosis that can develop when your cat doesn't eat. Plus, they just need nourishment. I've had to force-feed two cats before, and it isn’t a pleasant experience. You feel like you are torturing the being closest to you, but you know you have to do it. We’ll see what they say tomorrow. Halloween is coming in a few days. Unfortunately, there are cruel people in the world that use this holiday as a time to hurt cats, especially black cats. I have two indoor black cats. (I'm a great black cat fan and have had black cats for over 20 years.) They will be safely inside this year. 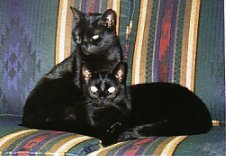 If you have any cats, especially black cats, please protect them from any potential harm by keeping them indoors at night for the next few days. Today is the Fourth Annual Feral Cat Day in the U.S. The purpose of the day is to bring attention to the plight of feral cats and their advocates who support Trap-Neuter-Return (TNR) as the most humane, effective and cost-effective strategy for managing feral cats and helping to reduce their numbers. Animal shelters in some areas support TNR by helping volunteers to trap feral cats and then neutering or spaying at low or no cost. Volunteers are then responsible for returning healthy cats and (hopefully) caring for them. Check with the local shelter in your area if you would like to become involved with helping feral cats. PetCareRx Fall Pet Lovers Special! From now until November 10, save 10% on all orders at PetCareRx. Nows the time to stock up on flea control and other pet medications and save some money! After my last cat blog entry, I decided to look around for the best cat beds on the internet. I've listed them on one cat beds page for your convenience. I hope this helps you to narrow down your search. The page may take a while to load if you're on dial-up. What about Cat Beds? Do you need a special bed for your cat? I woke up this morning with my head on a small corner of my pillow. My cat, Neko, was comfortably sleeping in the middle of the pillow. Cats are like that. They may have a comfortable cat bed of their very own, but they pretty much sleep where they want. If you're thinking about buying your cat a bed, or trying to get your cat to use one you already bought, check out our cat bed page. So very many cat products sites are on the internet. To help sort through the many choices (good and bad), I've added a Cat Products page for your convenience. This is a list of my favorite and recommended online pet stores. Have you ever noticed your cat licking at your water faucets? For some reason, most cats love to drink from running water. Pet fountains allow your cat to have a continuous supply of recycled, running water. They are economic, efficient, and provide a wonderful, healthy treat for your cat. As I visit forums and other cat blogs on the internet, one thing I've noticed is that the topic of declawing is very much like politics. What I mean is, people feel very strongly one way or the other, and there's often no way someone will change their mind. They either are very opposed to declawing cats, or they see no problem and wonder "what's the big deal?" Not only do some people have strong opinions on the topic, but some nations do as well. For example, in the United Kingdom, it's illegal to declaw cats; and this is only one of many nations that has outlawed declawing. Personally, I'm opposed to declawing. I believe it's totally unnecessary and if you're bringing a cat into your home, then you need to learn what to do to make it workable for you both. The biggest concern is usually that the cat is scratching furntiture. There are products, such as Sticky Paws or Soft Claws that can take care of this problem and protect you and your family from cat scratches. For more information on alternatives to declawing, see our cat declawing page. I've recently added information about Advantage Flea Control, Program, Frontline Plus, Frontline Spray and Frontline Top Spot. All of these conventional flea medications are supposed to be less toxic than older flea insectides. They are all very effective, but it was interesting to note that, especially for Frontline flea products they warn you to wash your hands if you touch the topical solution. Yet, it's supposed to be safe for your cat. Hmmm. Maybe natural flea control is the better way to go. The best place to buy these conventional flea medications at a deep discount is 1800PetMeds. For excellent natural flea control products that are much safer for you and your cat, check out Only Natural Pet Store.